Nebraska (7-2, 1-1 Big Ten) went ice cold in the second half and dropped to .500 in conference play with an 85-77 loss at Minnesota (7-2, 1-1) on Wednesday night. Minnesota has struggled offensively this season for the most part. If there are two things they do well, it’s crash the offensive glass and get to the free-throw line. If the Huskers limited the Gophers in those two areas, Minnesota was probably going to have a hard time scoring. The Huskers did a great job on the glass. Minnesota grabbed two more offensive rebounds (15 to 13), but second-chance points were even at 18-18. Nebraska didn’t do a great job of rebounding on the defensive end, but the Huskers at least made it a wash by attacking on the other end. However, the “playing without fouling” thing? Yeah, that didn’t happen. The Huskers committed 22 fouls with most of them either shooting fouls or in the bonus as Minnesota shot 24-of-32 from the charity stripe. The top two names on the scouting report for Minnesota were Jordan Murphy and Amir Coffey, and those two combined for 50 points and 27 free-throw attempts, about twice what the duo averages. Coffey, the 6-foot-8 swingman running the point for Minnesota, finished with a career-high 32 points on 8-of-16 from the field and 14-of-17 from the foul line and also chipped in six assists and six rebounds in 31 minutes. Nebraska couldn’t find someone that was capable of staying in front of Coffey when the junior looked to get downhill. Nebraska lost by seven, but it was a one-score game with about 10 seconds to play. Trailing by three, Nebraska needed a stop, and it got one. What it didn’t get, however, was a rebound. Nebraska failed to pull in the ball and Isaiah Roby committed his fifth foul in the scramble. Minnesota went down and made it a two-possession lead at the stripe on the other end. Game over. Failure to execute both points of emphasis on the play they could least allow sealed the loss. 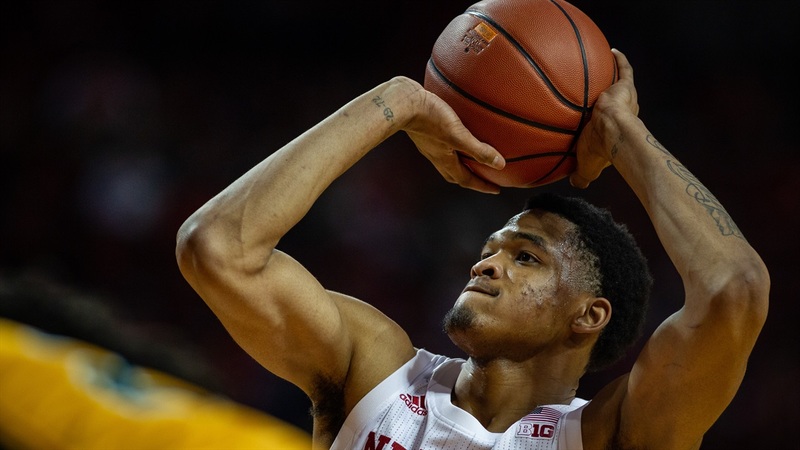 Outside of a short stretch where Coffey put the Huskers on his back and attempted 10 free throws, the first half went about as well as the Huskers could have hoped. Points in the paint were even and Nebraska was plus-nine in points from the 3-point line. The Huskers forced twice as many turnovers as they had themselves (eight to four) and outscored the Gophers 15 to three in points off those turnovers. Six different Huskers had at least two buckets led by James Palmer Jr. with 11 points. The Huskers held a five-point advantage at the break. Nebraska stretched that lead to as much as 13 in the second half behind a strong start by Isaac Copeland Jr. and Roby with eight points apiece in the first 10 minutes of the second half. Minnesota cut it to eight several times, but the Huskers seemingly had an answer each time. The Huskers led 68-58 after a free throw by Roby with 8:42. From that point on, the Huskers scored just 10 more points. They shot 3-of-12 from the field, 0-of-4 from deep and 4-of-7 from the free-throw line with a charge mixed in there for good measure. Palmer, the team’s leading scorer, went scoreless in the second half, missing all seven of his shots, and he was the primary defender on Coffey. Over that final 8:42, the Gophers scored at will, ripping off 27 points to turn a double-digit deficit into a comfortable win. Tim Miles and the Huskers have to get this thing figured out. The Huskers have two losses now and in both games they simply couldn’t find a way to get a bucket when they needed to. The other team isn’t always going to give Nebraska chances to get out in the open floor. They need to be able to execute in the halfcourt when the pressure is turned up. Isaiah Roby actually managed to stay out of foul trouble against the Golden Gophers, but Isaac Copeland and Tanner Borchardt did not as both of the big men picked up two fouls in the first half. Enter Brady Heiman, the 6-foot-10, 215-pound freshman. Heiman made all four of his shots including a pair of jump hooks for eight points, grabbed four rebounds including three on the offensive end and blocked a shot in eight minutes. The Huskers were plus-4 with Heiman on the floor. One of Heiman’s offensive rebounds led to a foul on Minnesota star Amir Coffey, his third. The 6-foot-8 wing had scored 14 points for the Gophers before taking a seat for the final four minutes of the half. Heiman split a pair of free throws and grabbed another board to finish with nine points and five rebounds in 15 minutes. He had totaled just five points in his previous five games and logged a DNP-CD during that stretch as well.